Hi everyone! It's been almost a year since my last post. I've been really busy and I am just too tired to blog. Well now I have found my zest and will start blogging again. My paternal grandma just passed away on 11 September (yeah what a memorable date!) from liver cancer at the age of 84. I have learnt a lot about her death and has been reading it up (under the Buddhists' perspective on death) and it has helped me to deal with my grandmother's death. My grandma, Magdelene, was diagnosed with liver cancer about two months ago and the diagnostic was bad. At most she will live for about three to six months. 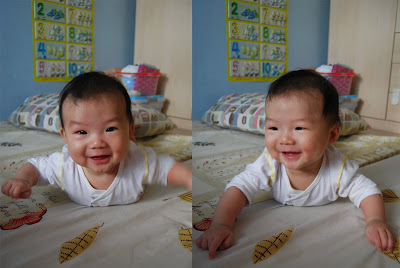 I have been (along with my parents and my family) visiting her weekly in Johor, Malaysia, where she was living with my uncle and his family. I feel that the regular visits were helpful to me or rather all of us as we were slowly accepting that she will not be here forever. She was in a lot of pain. But grandma Magdelene was a strong woman and she refused morphine and bear with the pain. My auntie and cousin would give her longevitology therapy daily to ease her pain. Occasionally she will joked with us and told us she will be migrating soon and probably to Australia. 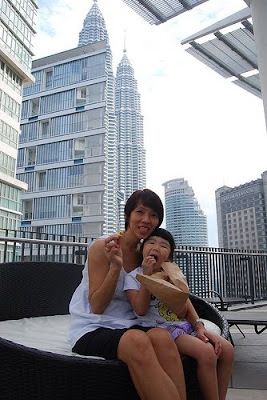 Three days before her passing, she told my auntie that she will be migrating soon. She was in such pain she was admitted to the hospital and the doctor said that she will not survive more than three days. And on the third day morning, she has passed away peacefully with her sister by her bed while my uncle and their family went out for breakfast. My family and myself rushed to her in the morning but just couldn't make it in time. I did not have the chance to say goodbye but at least I know that she was no longer in suffering and is in the safe hands of God (grandma Magdelene is a Catholic). I gave her my last love and said some prayers for her and felt a sense of ease and sadness at the same time. Grandma Magdelene had a grand farewell. My little cousin who is my grandma's favourite grandchild, dreamt of her on the day she passed away. She said that my grandma was very happy and she took her to a place (I guess it's heaven) where it was cold and they were cloud hopping! And there was a long table full of delicacies and grandma Magdelene was holding an older woman's hand (who was her mother). Everyone felt happy as we know that grandma Magdelene was free from suffering and has moved on to another life. In Buddhism, we believe that death is not the end and it is another journey. I felt I have understood life and death a little more and will continue to live life to it's fullest and continue to be a better person every day. Last week I made three mini bridal veil hair clips for Georgia and her best friend, Jemima. And when my neighbour's daughter, Faith, saw that the other girls having the clips on their hair, she asked her mum why she doesn't have one. 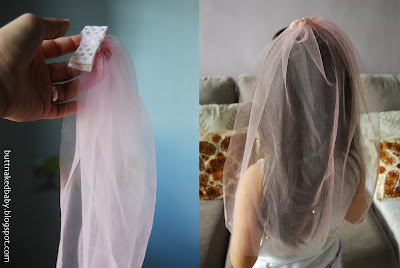 So I offered to make her the veil too. It was really easy to make. I just used some ribbon and some sash and made the clips while Georgia and Kieran were sleeping at night. I have yet to take photos of the girls with their clips. I'll post the photos once I have taken them! 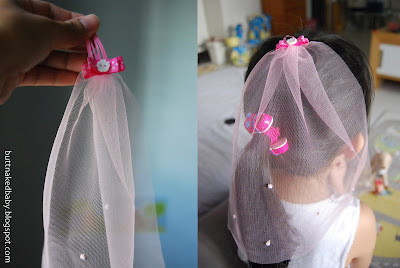 This clip is for my neighbour's daughter as she's only three and I made her a shorter veil. This is for Georgia and Jemima. I also sewed little flower buttons at the bottom of the veil. We drove to Kuala Lumpur, Malaysia, on Tuesday to attend the funeral rite for my grandmother who passed away two months ago. I did not get a chance to attend her funeral then as my passport has expired and Kieran does not have one. I am glad that I am able to give her my respect and I 'chatted' with my grandmother (the tablet with her name). It was good to see my relatives. I especially enjoyed hearing all the gossips! Hahahahaha! More photos on my flickr album. Do you have such an experience too? 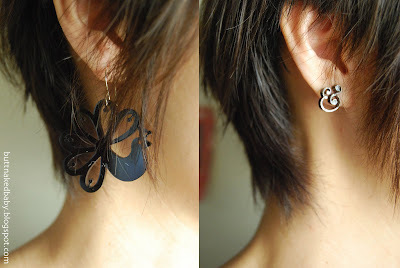 My dear friend Salihan has recently opened a web shop selling her handmade crafts. 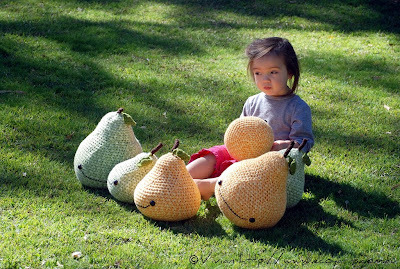 She has made some really adorable and lovely Amigurumi Pears! Do hop on over to her shop to check them out! And she has a fabulous blog too! Photo taken from her blog. Today is Georgia's birthday and she has turned five. She requested for Disney princesses birthday cake and we bought her an ice cream cake from Swensens. And the presents she received from us is the Disney princess story book that comes with a mini movie mechanical toy projector, my parents gave her Charlie and Lola activity pack and a colour airbrush art set from my brother. Georgia is sooooo happy today! Time flies and I can't believe the little baby girl born five years ago is already five! I can still remember her crawling into the bathroom looking for me when I was in the shower. It was just like yesterday that she was still on breastfeeding. I can also remember her crying every morning when we have to leave her at the childcare (at 20 months old and for almost 11 hours a day!) and thank goodness I'm home to look after my children now. I seriously can't bear to go through that phase again. It just breaks my heart to leave my children at the childcare. I've made some sacrifice and I think it's worth it for me to spend my days at home nurturing them. Sometimes it still fascinates me that I am a mother of two. I heard a joke on the radio a couple of days ago and I'd like to share it with everyone. An air stewardess was serving meals on board the flight and she stopped beside a man she was going to serve. Passenger: What are my options? Air stewardess: Yes or no. Hahahaha. I think it's quite simple and funny! ^_^ Have a good day folks! Recently, Andy and myself have a new craving, all thanks to my best friend, Melanie. 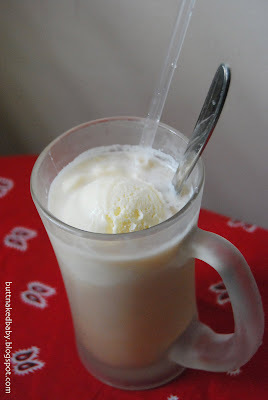 She introduced us to Oolong milk tea with ice cream and pearls from KOI Cafe. This drink is delicious!!! We would always get the biggest cup each whenever we are in Ang Mo Kio. Even Georgia has taken a liking to it. Initially she doesn't like the tea as it has a bitter taste but now she loves it as much as we do. I have managed to whip up my own version (not as good as KOI Cafe but good enough to satisfy the cravings) whenever I have the cravings and don't have the time to travel to Ang Mo Kio. 1. Mix the oolong tea with condensed milk until fully dissolved. 2. Drop the scoop of ice cream into the tea and you're ready to drink it! Next up is our favourite chocolate chip cookies. These are from Vegan with a Vengence. 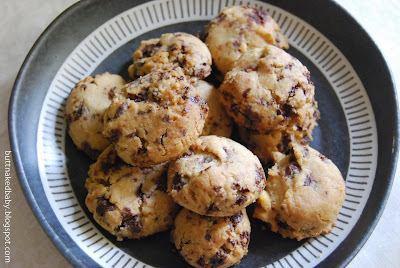 They taste as good as Famous Amos and they are extremely addictive! I added some other ingredients to make it even more delicious! 1. Preheat oven to 350 degF or 180 degC. 2. Cream together the margarine and sugar until fluffy. Add molasses and vanilla extract. 3. Add the flour, baking soda, dessicated coconut, grounded flax seeds and salt, and mix well. Fold in the chocolate chips. 4. Drop by teaspoons spaced a little over 2 inches apart onto ungreased cookie sheets. 5. Bake for 8 to 10 minutes, until ever so slightly browned. Let cool on the baking sheets for 5 minutes, then transfer to a cooling rack. Note: You could refrigerate the cookie dough for about 30 minutes to prevent them from spreading too much during baking.